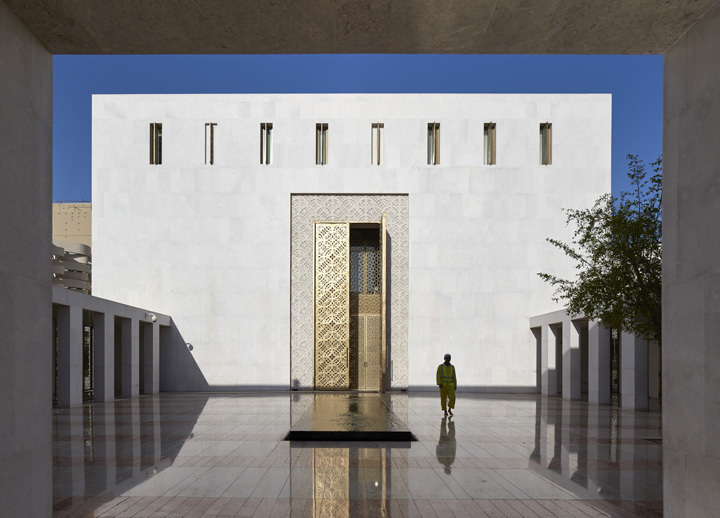 The design of the Jumaa Mosque fuses Modernist ideas with an historically familiar arrangement of Islamic volumes, spaces and thresholds. 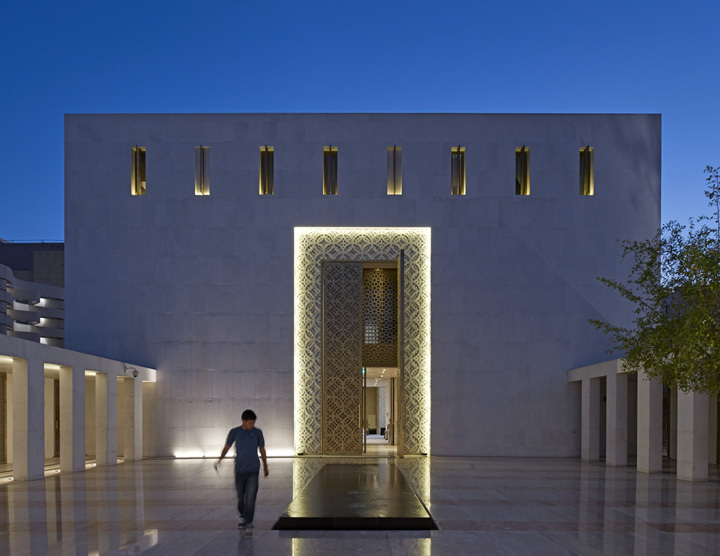 The scheme uses local stone, craft techniques and interpretive details. 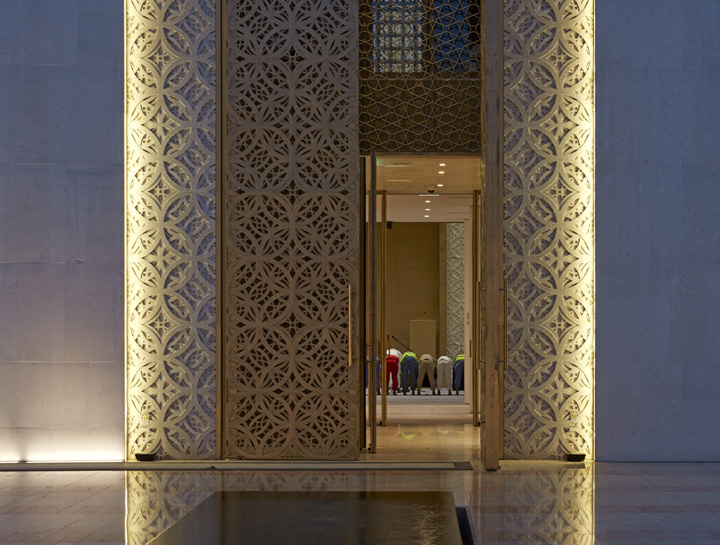 The architect McAslan’s concept has evolved from the traditional Qatari mosque and follows the principles of simplicity, functionality and spirituality, combined with a modern interpretation of materiality and order. 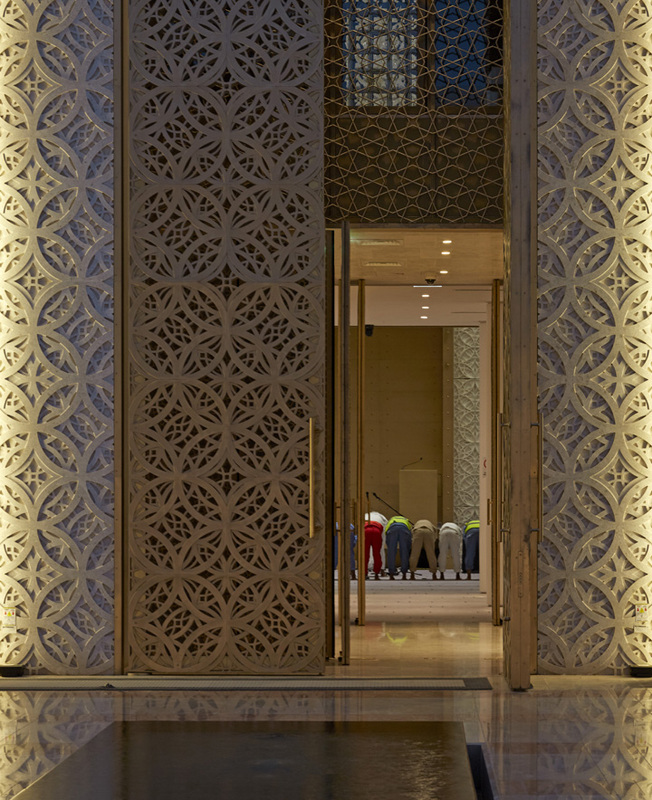 A key challenge of the design was ensuring that the entrances to the Mosque and the interior spaces once inside, were able to be accessed separately by men and women, in accordance with Islamic customs. Mosque exterior with minaret. Jumaa Mosque, Doha, United Arab Emirates. Architect: John McAslan & Partners, 2017. 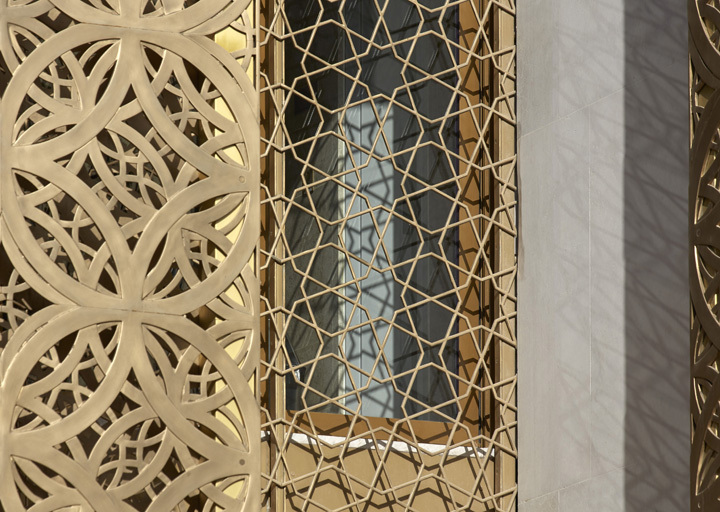 Detail of gold perforated patterned metal screen. Jumaa Mosque, Doha, United Arab Emirates. Architect: John McAslan & Partners, 2017. Twilight view with solitary figure and entrance. Jumaa Mosque, Doha, United Arab Emirates. Architect: John McAslan & Partners, 2017. Early morning view with solitary figure and entrance. Jumaa Mosque, Doha, United Arab Emirates. Architect: John McAslan & Partners, 2017. Interior of mosque during prayers with dappled light. Jumaa Mosque, Doha, United Arab Emirates. Architect: John McAslan & Partners, 2017. View into mosque through gold doors during prayers. Jumaa Mosque, Doha, United Arab Emirates. Architect: John McAslan & Partners, 2017. View in mosque through gold doors during prayers. Jumaa Mosque, Doha, United Arab Emirates. Architect: John McAslan & Partners, 2017. Abstract view through geometric islamic patterned screen. Jumaa Mosque, Doha, United Arab Emirates. Architect: John McAslan & Partners, 2017. Mosque courtyard midday prayers with minaret. Jumaa Mosque, Doha, United Arab Emirates. Architect: John McAslan & Partners, 2017. Geometric islamic pattern detail. 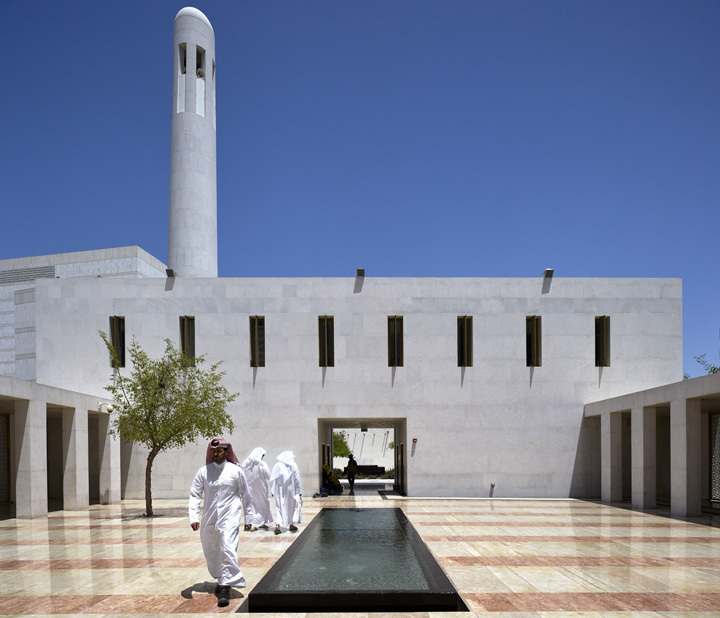 Jumaa Mosque, Doha, United Arab Emirates. Architect: John McAslan & Partners, 2017.